Mr. Hitchcock is, like the director’s work itself, very much a mixed bag. 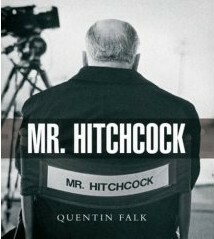 The title of Quentin Falk’s book suggests a respect that the book does not always hold- consider the frequent references to Hitchcock’s ‘egg-shaped physique’ (p.16), that he was ‘increasingly rotund’ (p.23) and the inclusion of a Michael Powell quote that Hitchcock ‘really was the fattest young man I had ever seen’ (p.37). That these three comments occur in the first quarter of Falk’s book suggest an uneasy balance of biographical musings and over-familiar friviolity. The book starts its exploration of Hitchcock’s life and career with a focus on Frenzy (1972), almost the director’s swan-song. That Falk feels the film to be ‘problematic’ and ‘strange, often uncomfortable [in] nature’ (p.15) seem odd comments given the amount of time spent on analysing it (compare this with the few lines afforded other works worthy of extended comment like Sabotage(1936). True, the piece on Frenzy is used as a summation of Hitchcock until that moment in time- a man now in his early seventies looking back on an illustrious career- but Falk underestimates the sheer force and power of this, Hitchcock’s last great film. As for the ‘uncomfortable’ aura of Frenzy - are Hitchcock films intended to be about making us feel wholly comfortable? Surely the opposite! However, Falk’s feelings about Frenzy aside, the book needs to begin somewhere before tracing the director’s formative years and his meteoric rise. As Mr. Hitchcock progresses through its subject’s life and career the previously-cited uneasy balance (inferred from the title contrasted with the treatment of the man inside its pages) becomes sadly more apparent. Although ‘plain’ biographical details are present, amusing anecdotes are used to help us understand Hitchcock’s ways of working. These are often connected with films to which an uneven balance of attention is subsequently drawn. Therefore, some are discussed at length- including the cardinal sin of recounting plot details even down to outlining the resolution of the closing sequence (of which Hitchcock would certainly not have approved! )- others summarily dismissed in a few sentences or even words, such as The Farmer’s Wife and The Manxman. Given the plethora of available material on the director, and the much-lauded ‘interviews with Hitchcock’s most valued collaborators’ (p.2), a detailed plot description of a film like The 39 Steps is not actually necessary, but an insight into how Hitchcock developed his cinematic style in his early silent films is. Despite its winning formula (that its subject was not only idiosyncratic but highly interesting in his own right) Mr. Hitchcock incorporates a most odd, uneven style. In the way that Hitchcock’s stylish direction is subtle yet obvious, Falk’s narration of Hitchcock’s story is obvious yet clumsy. Just one example of this occurs on page 50- ‘C.M. Woolf, who clearly believed the company’s hottest property to be far too clever for his good would, if Michael Balcon hadn’t swiftly intervened, have happily terminated Hitchcock’s contract.’ This is typical of the writing throughout, which tends to be either overly detailed or brief to the point of foolishness- ' Young and Innocent(1937)…is essentially forgettable'. (p.53). Actually, as in the case of Frenzy, this author begs to differ- Young and Innocent is a delightfully unpretentious film that is both a fascinating evocation of pre-war Britain and a splendid forerunner of later Hitchcock films. A typical Hitchcock film uses carefully constructed set-pieces to set an increasing pace prior to the crescendo of tension which often marks the film’s closing sequence. Mr. Hitchcock on the other hand stumbles doggedly along a slightly uncertain path, arriving at its destination tired and in need of a drink followed by a good lie-down as a result. Although, like Hitchcock, it has a good tale to tell, the book does not imbue its tale with any cinematic aplomb, preferring to plod along uneasily on the back of a handful of anecdotes and a reliance on existing interview material (the landmark conversation Hitchcock had with French director Francois Truffaut is frequently utilised). There are some lovely monochrome illustrations however, the evocative publicity pictures more than compensating for the bland choice of stills from the films themselves. These pictures are complimented by some nice candid pictures of Hitchcock himself to brighten up a sometimes rather jerky narrative. In the modern age of the high-speed Super Highway, information is more readily accessible than ever. Putting the two words ‘Alfred Hitchcock’ into search engine Google yields over 9.5 million matches. It would be safe to say that there is no shortage of material written on ‘the Master of Suspense’. Though this would seem a positive development, it is perhaps an adverse one for any writer attempting to find a new angle, a new slant, on a director whose career lasted over 50 years and began in silent films but came to embrace not only sound but colour and widescreen technologies. Put simply- any new work on Hitchcock, for me, needs to say something new. It is not enough to recycle the Sunday roast of existing material as Monday’s literary stew. What the film world needs is a fresh piece of cinematic meat, thoroughly cooked and served fresh with a frisson. What Falk’s book, for all its gloss and sheen, serves up is a reheated melange. Hitchcock, one feels sure, deserves better than that. 'Mr. Hitchcock' is published by Haus Publishing.